JukkaR: ProjectX - One problem solved, again! 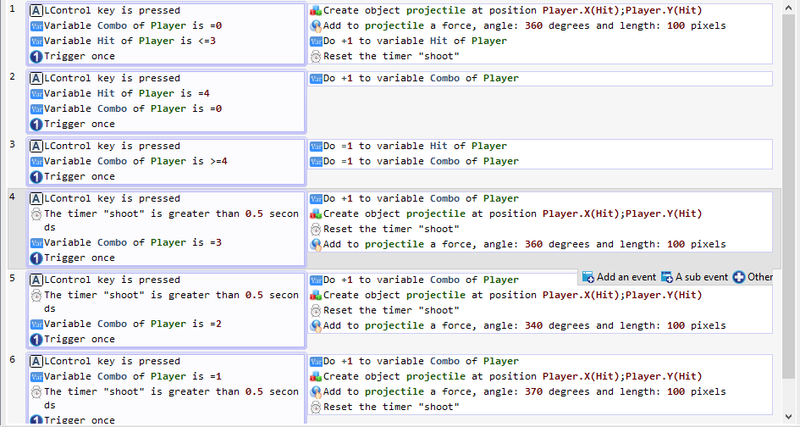 I had a problem making one of the game mechanics. 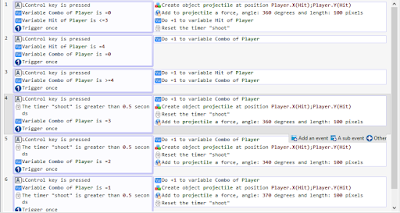 Shooting projectiles first 4 in front and then when you smash the button 4 or more times fast enough you can shoot projectiles three different directions by turns: diagonally up, diagonally down and straight front. I try to make lot of different things with variables and numbers, but never succeed. Then I had to ask for help from GDevelop forum and just like last time, I did get help and answer to this problem! Now it works how it should be. Only difference is that after 4 projectiles you can keep button pressed and don't have to smash the button. But I think it's pretty cool so I keep it for now how it is. But anyway, ProjectX is making progress and it's very relief that when I encounter overwhelming problem, I can get help from the forum! Thanks Lizard-13 from GDevelop forum!